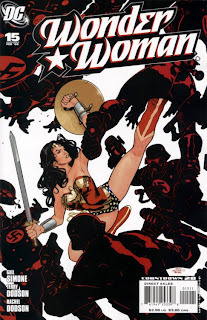 Norton’s art has been the lowpoint of this book for all of the Kreisberg run and it doesn’t really improve in what in what I think is Kreisberg’s last issue here. The art made the story muddled and confusing. 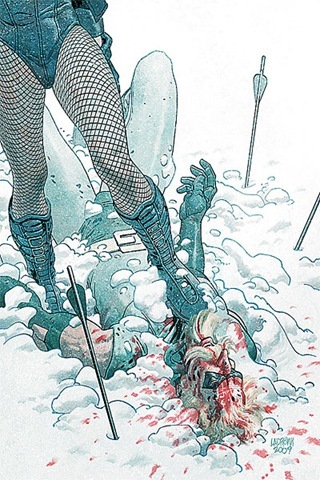 Did Cupid revert to her normal state because she got shot with the arrow? 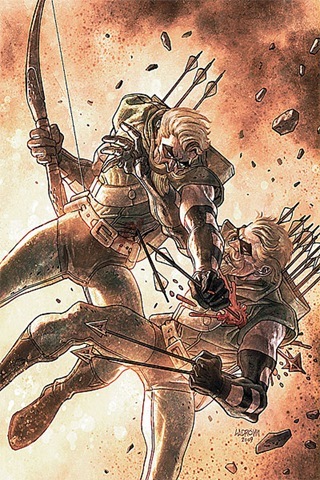 Is Lt. Hilton now going to be Green Arrow’s Two-Face, but called Hilt? The final page of Speedy saying bye seemed appropriate as Star City is going to get phased into another dimension in Cry for Justice and this takes place before that mini, I imagine Speedy will be taking care of Lian while the city is in a different dimension. The months ahead should be more interesting for this title. 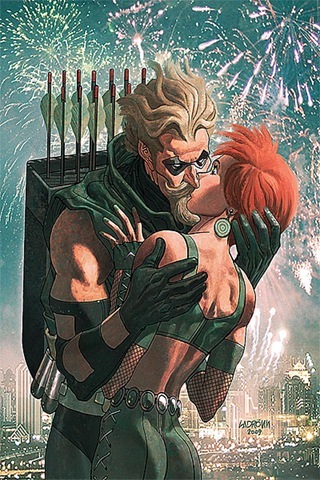 Too bad this whole storyline hasn’t been hampered by awful horrible art, because when it all comes together here it actually makes Cupid to be a very interesting super villain. A woman given an experimental serum by the military to make her more aggressive has the side-effect of causing her to become incredible violent and obsessive. She is the true Super-Stalker. I like the idea if not the execution. 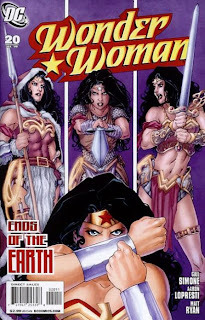 Mike Norton’s art and the inker are just plain awful on this book. I can not wait for it to change. Norton’s art is better then it has been here but it is still a chore to look at. I did like this issue as we get some backstory on Cupid – apparently she worked for some assassin organization and she wasn’t so crazy before. Interesting. 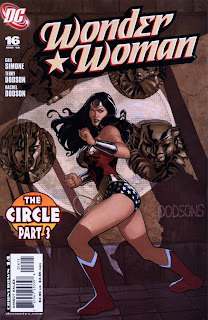 Kreisberg’s run ends in a couple issues so he better explain a lot soon. 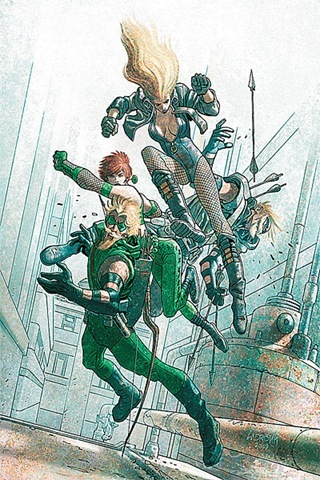 Not going to lie, I have no idea who those guys were at the end of this and why they are putting Everyman in as Green Arrow again or what not. Was it even Everyman? We never saw any proof of that. This storyline is already annoying and we are only one issue in. The art in this issue was just awful. Why can’t this book get good art? Both Norton and Guedes are better artists then this crap. This book has just gone down hill. Oh will Amazons Attack never end. 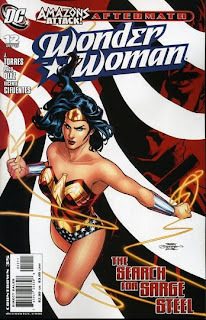 The god-awful mini-series spills over into this issue as Wonder Woman and Nemesis look for the missing Sarge Steel. Of course this issue wasn’t bad though, Everyman is always a fun villain. Now this was more like it. 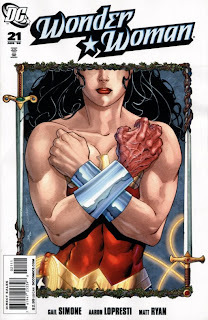 A very sweet issue that while still dealing with the Amazons Attack aftermath, it is not burdened by it one bit. I liked seeing the JSA wondering about Hippolyta, it’s easy to forget that she was once a member of their team and they WOULD react to her coming back from the dead. 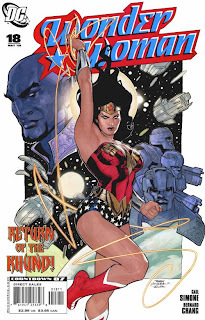 Gail Simone’s first issue may not have completely blown me away, but it was pretty damn good…especially when compared to the previous runs on this series. Bringing back Etta Candy is genius, having female gorillas live in Diana’s apartment is genius, and Nazis attacking Themyscira is genius. I think we can say Simone is a genius. 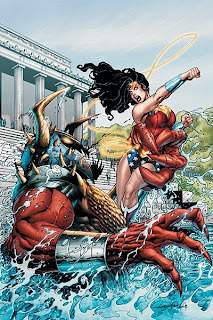 I like the idea of Wonder Woman going to the different Pantheons of Gods seeking help and I especially like that she ended up receiving that help from an obscure pantheon – the Hawaiian Gods. Very awesome. 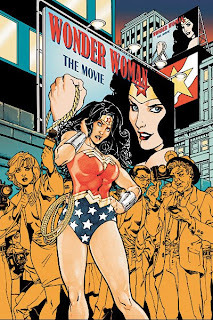 Oh and can I saw Diana’s transformation into Wonder Woman at the beginning was beautiful. Go Dodsons! 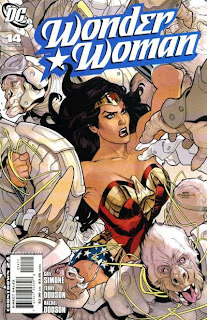 This issue was sligtly decompressed as it was essentially just one big battle between Wonder Woman and her gorillas, and the Nazi on Themyscara. Although it wasn’t bad, I was kinda expecting more. 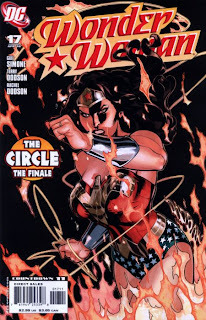 This concludes Simone’s first story arc on this title and I must say it was a great ending. The entire thing could have been an issue less but it was still a good arc. And Simone had Plastic Man in it! Yay! I also like how Simone is setting up these mysteries in advance…effectively creating a slow build that a long term writer should do. Haha I did not know this but Etta Candy’s catchphrase is Woo Woo and Simone uses it in the final page of this issue in a very modern and hilarious way. The art took some getting used to after the Dodsons but it wasn’t bad. I am not sure how I feel about Diana courting Nemesis, we will see how it goes I guess. This short story arc was very good. I liked how the Ichor is set up to be threats in the future and Etta Candy is a great sidekick for Diana. 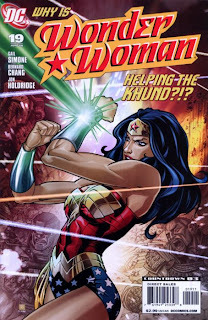 I am not sure how they made the Khund girl a Green Lantern, did one of the GLs die. I thought someone only becomes a GL when a previous one dies? And doesn’t the ring choose the person? Eh…I can’t really get excited about this arc. 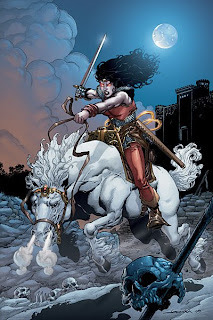 Wonder Woman in a sword and sorcery world does nothing for me. The only moments I really enjoyed were the stuff with Etta Candy. 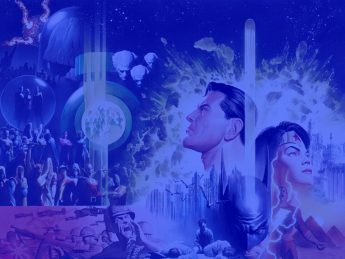 Other then the scenes outside of the otherworldly plane (the stuff with Nemsis and the stuff with Hippolyta), I found this pretty boring. Which isn’t Simone’s fault as much as I am just uninterested in this kind of story. Ditto, but it is good to see Donna again in this title. The moments between Donna and Nemsis were fantastic this issue but I am still glad this arc is over. This was a pretty good issue…I especially liked the end with the little girls. 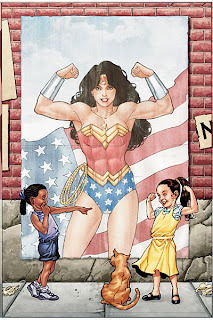 I think more little girls should be looking up to Wonder Woman….we need a good Wonder Woman movie soon. 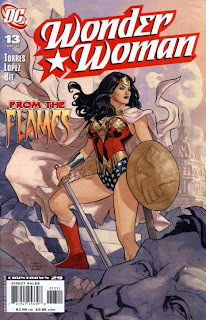 I like how Simone really expressed her opinion about the Wonder Woman movie in this issue….that we should wait for a really good one instead of getting a crappy one now and I agree with that but it would be nice to have a good one soon. I guess you can’t get your cake and eat it too.